I was a member of VJ 1 "VW 3" in 1953 & 4 and made the fight crew as back up Plane Captain after the lose of the plane in Doris. I see Bill Broeffle on the roster but I am not there. Bill and I spent two years together in the States and then two years in VJ 1 on Guam. In March of 1954 I had an interesting experience. We lost one of the four engines when we were on a search and rescue mission looking for two British Canberra jets that were lost while monitoring a 1954 atomic bomb test. We were not able to maintain altitude due to the weight of the fuel tanks. We tried to jettison one of the tanks but it hung up and would not drop. I volunteered to go into the bomb bay to see what was wrong and found that the tank had dropped part way but was stuck. This meant that even if we dropped a second tank to maintain altitude we could not land with the tank extending below the airplane. After a discussion, I went back into the bomb bay and tried several methods to free the tank without success. Then I braced myself and kicked at the tank with both feet until it dropped. When the tank dropped, the plane jumped. I was bent over backwards injuring my back and was blinded by aviation gasoline in my eyes. When the bomb bay doors were closed, the crew came into the bomb bay and helped me back to the cabin. I did not get a medal but I was awarded several months later when the Plane Captain had to take emergency leave. When our pilot ask who the Plane Captain recommended as a replacement, he recommended me. Since the pilot happened to be the Squadron Commander and was piloting the plane when we lost the engine he agreed and I became the squadrons "Boy Plane Captain". I did get to fly through several typhoons at 300 feet and even got to copilot through one when the copilot got too sick to fly and the pilot needed strong arms to pull back on the controls. Later the Squadron Commander granted me early discharge so I could attend Engineering College. Are there still reunions? Are any of the people on the attachment members. John Walpole was mentioned in some of the things I read today. He was our radio man and senior enlisted man in our crew. The attachment is from our Philippine hide out when we were flying weather out of there. I was not a member of the flight crew when we lost the PB4Y-2S in Doris but I volunteered as an observer and flew about every third day of the search. We were manning the front gun turret on four hour shifts since it was the best place to observe the sea below. I got to know the Pilots and Plane Captains well during these flights and was selected to be the backup Plane Captain on the new crew that was formed to replace the crew we lost. This became the number 1 crew with the Squadron Commander as our main Pilot. Later our Plane Captain was granted emergency leave and transferred to the States. Before he left he convinced Squadron Commander that I was ready to replace him and I got the job. Do you see the number 1 in the center of the lollypop. That was our plane number. It was a Navy PB4Y-2S "Privateer" four engine patrol bomber. I was the Plane Captain of the Squadron Commander's plane. 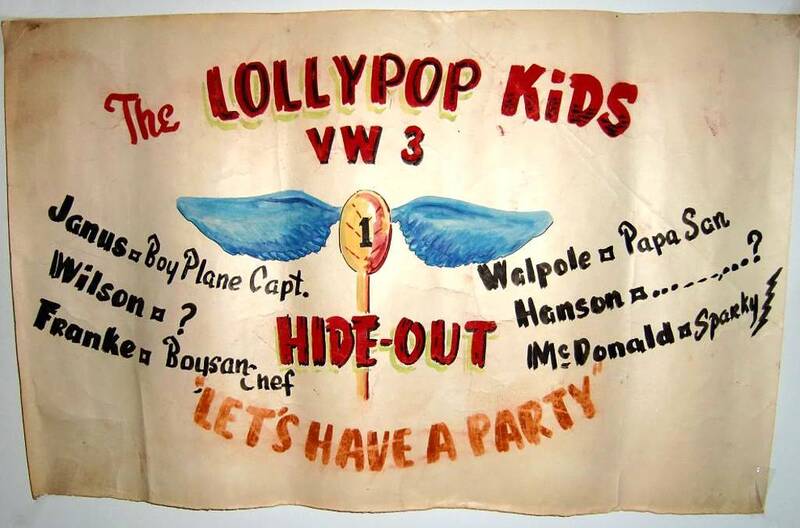 The crew made this poster to give me a bad time because when we land in Sangley Point, the ground crew came up to John Walpole ,our radio man, and ask him if he need any help securing the plane. He then told them to talk to me. John was the senior enlisted man on the crew and a number of years older than the rest of us so they figured he was the Plane Captain. It was displayed in our favorite bar and restaurant in Sangley Point in the Philippines. I was an AD 3 and probably the youngest and lowest ranked Plane Captain in the squadron so the name "Boy Plane Captain" stuck with me after the poster was made. We were stationed on Guam but were sent to the Philippines on two week assignments to fly weather flights out of there. When I was discharged early to go to college, someone in my crew retrieved it and sent it to me. Everyone on the poster was a flight crew member.